All hail the Blood Queen. Hellboy reboot actress Milla Jovovich has taken to Instagram to share what looks to be the film's first promotional banner, which features artwork by Hellboy comic creator Mike Mignola. The "in the wild" bit of marketing for the Neil Marshall-directed refresh depicts Jovovich's character, Nimue the Blood Queen, as well as the devilish cigar-smoking, shorn-horned Hellboy standing behind and to the left of her, holding a freshly fired gun. Jovovich spotted the banner on display on Wilshire Blvd. in Los Angeles, California, and captioned her snap of it with a fitting description: "The Blood Queen has risen." It remains to be seen whether the banner is simply a production placeholder or if it's a bonafide piece of promo that will be used during the official lead-up to the Hellboy reboot's theatrical release in January 2019. While studios have generally shied away from using comics art in promotional imagery for big-budget movies like this one, it's not a holy-cow-what-are-you-doing type of rarity, so perhaps Lionsgate Films is simply tapping into a more uncommon approach to push the new Hellboy film. In any case, the banner should keep Hellboy comic fans smiling until more promotional goodies are unveiled. 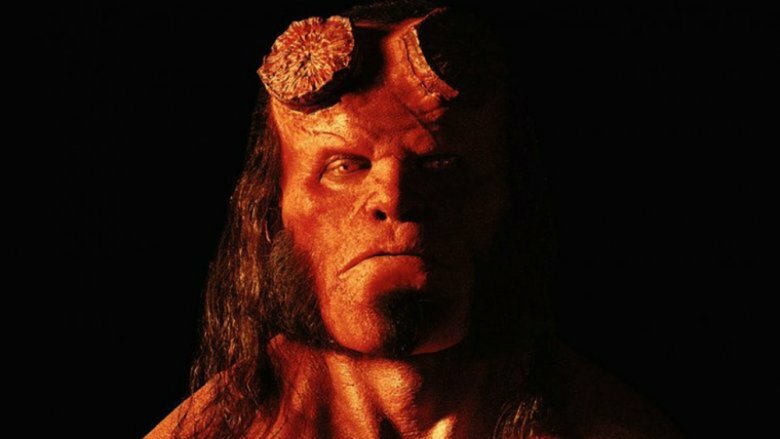 Previously thought to be titled Hellboy: Rise of the Blood Queen, the impending reboot stars Stranger Things actor David Harbour as Hellboy. Harbour takes over from original Hellboy actor Ron Perlman, who starred in director Guillermo del Toro's Hellboy in 2004 and in Hellboy II: The Golden Army in 2008. Rounding out the cast are American Gods star Ian McShane as Professor Trevor "Broom" Bruttenholm, Hellboy's adoptive father; Hemlock Grove starlet Penelope Mitchell as Ganeida, an elder witch hoping to put an end to the Blood Queen's reign of terror; American Honey actress Sasha Lane as Alice Monaghan, a girl Hellboy rescues after a pack of fairies kidnaps her; The Secret Life of Bees star Sophie Okonedo as Lady Hatton, a resident seer at the Osiris Club; mother! and Phantom Thread actor Brian Gleeson as Merlin, an ancient wizard; Rogue One star Alistair Petrie as Lord Adam Glaren, an esteemed member of the Osiris Club; and former Hawaii Five-O actor Daniel Dae Kim as Major Ben Daimio, a military member of the Bureau for Paranormal Research and Defense. Game of Thrones star Ed Skrein was originally cast as Ben Daimio, but exited the project amid allegations that the Hellboy reboot had whitewashed the character. Not a whole lot is known about the refresh, though Hellboy creator Mike Mignola previously noted that the film, a darker and R-rated take on the character, will remain as faithful to the written source material as possible, and will adapt three Duncan Fegredo-illustrated Hellboy miniseries: Darkness Calls, The Wild Hunt, and The Storm and the Fury. "The first film was based on one of the comics, but del Toro was looking to reinvent everything. I think the difference is here, the bulk of the Fegredo arc takes place in the real world," Mignola explained to Entertainment Weekly. "I think the bulk of the characters in the film are established in the comic. It was insane for me to walk in there and see that someone did a really nice rendering of a creature I created or Duncan created. It's got a whole different feel from the older movies. Duncan's not working on it, but I did see stuff in the movie that was so close to what Duncan drew, more so than what was in the previous movies. It was pretty exciting." Actor Harbour also mentioned that the pic will be different than the average superhero movie fare. "[Hellboy] is a whole new thing. I'd always been a fan of the comics and there's a darker tone to it and I think in the climate we have now there's kind of … a desire for more of that," said Harbour. "The script is good, and this guy, Neil Marshall, is directing, who's really good and the aesthetic is great. So often, the superhero movies can be really fun and I want this to be really fun, but I also want it to be more of a character piece and more about this dude's struggle. I think it could be interesting." The Hellboy reboot is slated for release on January 11, 2019.